What Does Code P0683 Mean? OBD II fault code P0683 is a generic code that is defined as “Glow Plug Control Module to PCM Communication Circuit”, and is set when the PCM (Powertrain Control Module) detects a communication failure between itself and the glow plug control module. Note that this code applies only to applications with compression ignition (diesel) engines. Although diesel engines rely on compression alone to ignite the air/fuel mixture, ignition of the mixture is very difficult to accomplish when the engine is cold. Therefore, all diesel engines are fitted with glow plugs whose tips extend into the pre-combustion chamber, and whose purpose it is to assist in the initial heating of the air/fuel mixture when the engine is cold. In terms of operation, a glow plug is a metal cylinder that contains a heating element that is in its turn, embedded in a ceramic material that transports the elements’ heat to the outside metal wall of the glow plug through convection. When a current is applied to the glow plug, the element heats the plug’s tip to a very high temperature, which serves as a heat source to initiate ignition of the air/fuel mixture in cold engines. 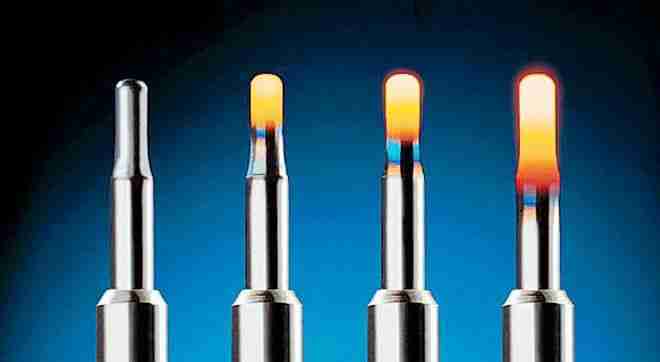 This image shows the progression of heat through a single glow plug from cold, to fully heated. While this process on older systems could take ten seconds or more, improvements in glow plug design coupled with electronic control systems means that all the glow plugs on an engine can now be heated in less than two seconds. This not only reduces start-up times even in sub-zero temperatures, but also extends the lives of the glow plugs and other components such as the starter motor. As a practical matter, modern glow plug control systems are relatively complex, and although the glow plug control module controls and monitors the actual heating of the glow plugs, the PCM needs to “know” exactly what is happening in the glow plug control circuit at all times to manage the overall fuel delivery and other engine management strategies effectively. Therefore, the PCM monitors the glow plug control module and its associated circuits very closely via dedicated communication circuits, and if any fault, defect, malfunction, or failure occurs that prevents effective communication between the PCM and the glow plug control module, the PCM will set code P0683, and illuminate a warning light. 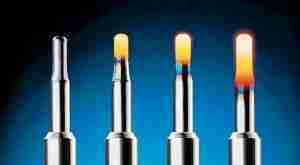 Nonetheless, it must be noted that glow plugs are not required to start a hot or even warm engine. To prevent the glow plugs on both old and newer systems from being activated when the engine is hot, the PCM uses input data from a dedicated engine coolant temperature sensor. When the coolant temperature exceeds a predefined limit, which is usually about 1040F, the PCM deactivates the glow plug control system to prevent premature ignition of the air/fuel mixture, which could cause damage to the glow plugs and/or the engine. Where is the P0683 sensor located? 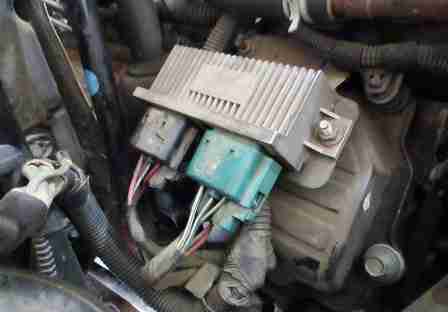 The image above shows the location and appearance of the glow plug control module on a 6.0L Ford Powerstroke application. Note that while in this example the glow plug control module is attached to the firewall, the actual location and appearance of glow plug control modules vary greatly between applications and manufacturers. Note that while the glow plug control module is located in the engine compartment on most applications, it is recommended that the manual for the affected application be consulted to locate and identify the glow plug control module correctly. What are the common causes of code P0683 ? Note that failures of glow plug control modules are relatively common, given the fact that on many applications the module is located close to hot engine and/or exhaust parts. None found. 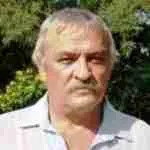 Ask a question about P0683.